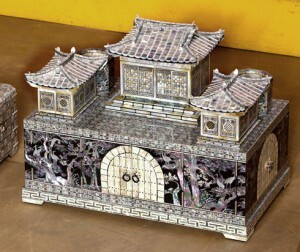 I present to Your attention a set of absolutely astounding items inlaid with nacre in the so-called Najeon style – which is a traditional Korean technique of decorating wooden pieces with inlaid nacre lacquer. First, the craftsman makes a piece out of wood, and then he applies to it several coats of paint and lacquer. After this, the processed surface is inlaid with very thin platelets of the mother-of pearl, cut according to a certain design – this nacre is taken from the inner layer of shells, mainly oyster mollusks. Then the ware is lacquered again and it acquires its final look after being thoroughly polished by hand. The colour itself of the mother-of-pearl varies, depending on the kind of mollusk and type of its habitat, and is determined by the colour of the upper layer of conchiolin. It may be light blue, green, white, cream, golden, pink or black. Since the times of old, in the countries of the East people believe that the mother-of-pearl is able to help its owners bring something new into their life. It helps to develop intuition, to keep peace and harmony in the family, and it protects the house from evil spirits. It is believed that pieces made of the mother-of pearl can be mascots to extend the days of life of their owner.